Extensive background on each of the numerous schools approved by the Guild. A complete history of the Guild, from its founding up to the present day. Details on the Guild’s most important NPCs, from the stalwart Miles Donovan to the deadly Linnae Knute. Rules and guidelines for conducting duels, including Reputation effects and ways to spin such conflicts into larger adventures. A host of tips for playing Swordsman Heroes. 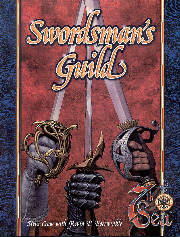 Nine completely new Swordsman Schools, approved by the Guild and ready to play!